Big cats trained for the circus often face a lifetime of punishment from trainers — but these tigers wouldn't let that stand in the way of checking on a friend. 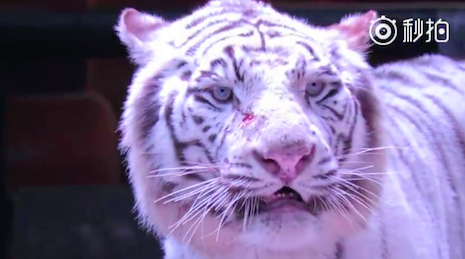 Back in January, a circus performance at China's Hangzhou Safari Park went awry when one of the park's white tigers reached his breaking point. Tired of being prodded with his trainer's whip, the tiger grabbed the tool in his teeth and dragged the man back across the stage. 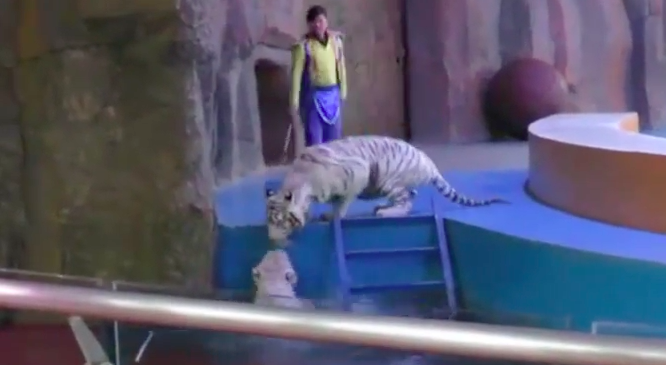 As a clip of the incident shows, eventually the trainer releases the whip, sending the tiger stumbling a few feet backwards into a water-filled pool in front of the performance area. The other trainers can be seen in the background cracking and waving their whips to keep the other tigers in line. But as soon as the first tiger falls into the pool, one of the others breaks rank and runs over, apparently to check if he's OK. The second tiger touches noses with the one in the pool, before realizing the trainers are closing in on him — he appears to cower, cautiously pacing back and forth between the two approaching men. One trainer appears to hit him with his whip, driving him back into the performing area. However, a few moments later, as the tiger in the pool drags himself back onto land, one of his friends again rushes over to his side — followed quickly by the rest of the rest of the tigers on stage, who surround the wet tiger, nuzzling him as he tries to dry off. Eventually, the trainers appear to give up, cracking their whips and yelling to usher the tigers off the stage. According to welfare group Animals Asia, the video went viral in China, where people were moved by the sight of the tigers displaying such worry for their companion. 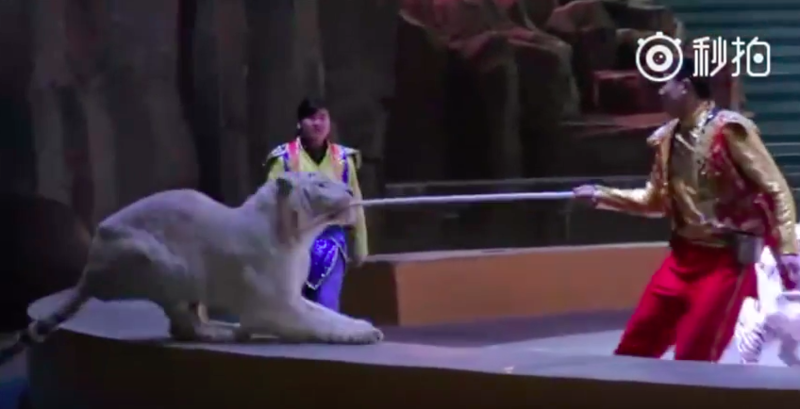 "The video clearly shows the tigers empathizing with the plight of their peer," Dave Neal, animal welfare director for Animals Asia, said in a statement. "They know he is in trouble and needs help and they want to give it to him. They are torn between their training, with its threat of violence, and their natural sympathy for another tiger in danger." China's circuses in particular have long been dogged by animal welfare concerns — a 2016 investigation into several Chinese circuses showed lions and other animals being beaten and kept in tiny, filthy cages between performances. But the problem is hardly limited to China. Across the world — including in the U.S. — circus cats are trained using fear-based methods: They'reoften whipped and shouted at, as the apex predators are unlikely to obey their trainers, let alone be safe to work with, unless they're "broken in." Performing elephants are trained using bullhooks — point instruments trainers use to jab at the animals and make them obey. But despite the attempts to break their spirit, it seems trainers can't entirely stifle the empathy that seems to arise between circus animals — back in 2015, a video emerged showing circus elephants rushing to the side of their friend who fell while being forced to perform a stunt. In this latest case at least, it seems some good has come out of the incident — Hangzhou Safari Park has reportedly suspended performances while conducting an internal review. But Animals Asia is still hoping the brief clip will help people in other countries see the plight of performing tigers in a new light. "These tigers were not born to perform — they do so under duress," the group said. "Not because they enjoy it." To help Animals Asia improve the lives of circus tigers and other animals in Asia, you can make a donation. You can also sign this pledgepromising to avoid shows with performing animals. Circus never were and ever will be for the sake of animals, they all were mistreated to perform beyond their capabilities for the interest of greedy people. Please people have a heart, animal circus is definitely one of cruelty towards animals. Educate peoples around you that ANIMAL CIRCUS IS CRUEL!